These soft foam pillows with photo realistic designs make for whimsical home decoration or an unforgettable gift. They are also great when travelling. Come take a look. If you love a bit of whimsical flair then you will love these designer pillows. With hyper-real images of everyday items like a brick, a wedge of cheese, or a slice of watermelon, they add a splash of the bizarre to any home or nursery. They’re from Field Candy, the company that brought us the most amazing tents we’ve ever seen. 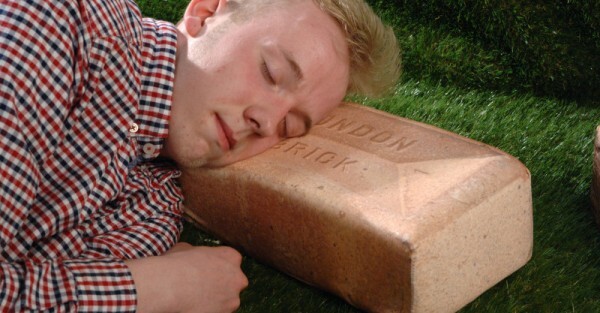 The soft foam that makes a Snoos pillow moulds to the shape of your head for a comfortable sleep. When not in use it springs back to its original shape. At only 250g in weight they are wonderful travel pillows since they’re really good at being squashed into tight spaces like a child’s overflowing backpack. 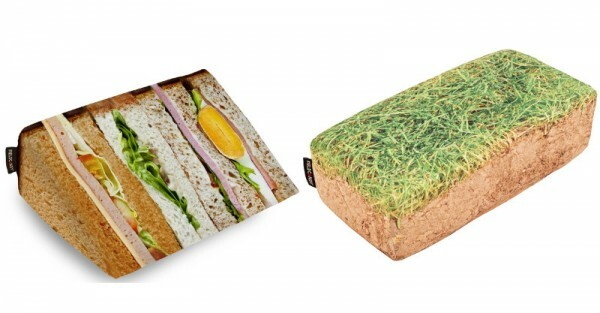 No need to worry about crumbs in the bed with this giant sandwich pillow – or how about a soft piece of turf to relax on? There’s even a log design for those who want to sleep like a log on a log. You can check out the full range at Field Candy where these playful pillows are priced at $39, plus shipping.